"We need the Coyotes," said the William Hill US vice president of marketing before the Golden Knights won 5-1. On an emotional night that included an incredible ceremony honoring first responders and victims of the Las Vegas mass shooting, the NHL’s Vegas Golden Knights came away with a 5-1 victory in their inaugural home game. It also marked the first time a major league professional sports team played a home game in Las Vegas, and that means the first time people could bet on a local major pro team in the Vegas-area sportsbooks. NHL commissioner Gary Bettman has stated — even in the last two weeks — that he doesn’t want the Golden Knights to be available to bet on for home games at nearby Vegas casinos. 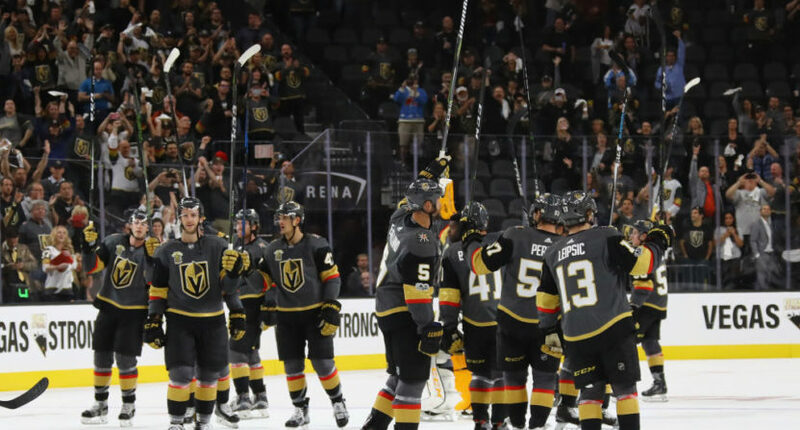 However, the Golden Knights were available to bet on at every Vegas sportsbook on Tuesday, according to ESPN’s David Purdum. And ESPN’s Arash Markazi later confirmed that,‏ even showing off his own betting ticket for the Golden Knights at New York-New York. Markazi was just one of many people to bet on the Golden Knights against the Arizona Coyotes. For every one bet on the Arizona Coyotes, there are 11 on the Vegas Golden Knights @CGTechnology_, per @jsimbal. Hockey in Vegas is here! Arizona Coyotes-Vegas Golden Knights is the biggest hockey decision ever for @WilliamHillUS, per @MikeGrodsky. "We need the Coyotes." Welp, that didn’t work out so well. As Purdum reported, the sportsbooks were expecting the action to increase significantly in favor of the Golden Knights entering Tuesday’s game, despite most bettors picking against the Vegas hockey squad in their previous two games this season. While bettors gravitated toward Knights games, they didn’t necessarily always back the hometown team. On Friday at William Hill, 64 percent of the money was on the favored Stars. It’s certainly no surprise people were picking against the Golden Knights in those first two games. Expansion teams are usually terrible, and especially to start off with a team full of new players and no chemistry (and the coaching staff is still trying to figure how to best utilize these players). But the Golden Knights pulled off impressive road victories to enter Tuesday night 2-0. So the Golden Knights were playing better hockey than expected going into their first-ever home game, and with the game also being the first home game since the tragic events of Oct. 1. Bettors surely figured the Golden Knights were going to do everything in their power to win this game and make their home fans proud, and against an Arizona team that had the fourth-worst record in the league last season (of course, many of the bettors were probably just picking Vegas because it was fun to actually be able to do that for the local team, and perhaps even the team they were about to go watch in person). Well, the bettors ended up being correct and victorious, and the Vegas sportsbooks ended up taking a big L.